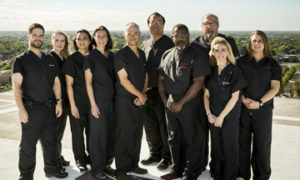 Because demand for around-the clock emergency surgical care has grown in this region, it was natural for Cooper to respond by leveraging its expertise to create a formal Acute Care Surgery program. An evolving specialty with three essential components—trauma, critical care, and emergency surgery— Cooper’s program is the first of its kind in South Jersey. “Just about every other community hospital has a general surgeon, but at 2 a.m. that surgeon is most likely on call and home in bed,” he says. “And so are the anesthesiologist and OR nurse. “So if a patient goes to that hospital in the middle of the night with appendicitis or cholecystitis, the emergency department will admit the patient, then call the general surgeon who probably sees the patient in the morning,” he continues. 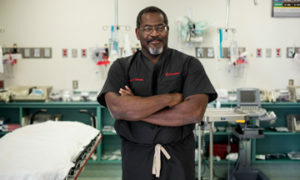 “But here at Cooper, we have a general surgeon who’s also a trauma surgeon—along with anesthesiologists, nurses, and vital support services—and they’re in the hospital 24/7,” Dr. Porter says. “So when a patient comes in at 2 a.m., they’re seen by a general surgeon at 2 a.m.
Tracey McSweeney, 38, from Audubon, New Jersey, is a recent case in point. After months of worsening abdominal pain, tenderness, and weight loss, she experienced an acute episode that sent her to her local emergency room in fear that her appendix had burst. A CT-scan showed some inflammation in her lower intestine, so she was started on an antibiotic and a steroid and sent home with the recommendation to follow-up with a gastroenterologist. She did so and began a diagnostic workup that included a colonoscopy—which was negative. The next step was to undergo an MRI. The day after her colonoscopy, however, McSweeney had what she characterized as “the worst, most severe pain I’d ever had. “I made it through the night but didn’t sleep, then my husband drove me to the ER at Cooper the next morning,” she continues. Imaging revealed an enlarged, inflamed gallbladder—acute cholecystitis. She was home within 48 hours and gives the Acute Care Surgery team high marks for the care she received. Cooper launched its Acute Care Surgery program after a survey of surgical critical care program directors and major trauma organizations confirmed that trauma and critical care surgeons are increasingly responsible for emergency surgical care. “This is because there’s an increasing need for trauma and emergency surgical coverage in both academic and community hospitals,” Dr. Porter notes. “And community hospitals, in particular, are looking for a partner to care for the patients in need of intensive surgical care. “Cooper is uniquely positioned to be that partner,” he adds. To facilitate access to this level of care, Cooper offers a streamlined, around-the-clock transfer service. “If a community hospital ER has a patient they feel needs more advanced care, one call to us and we’ll make it happen, regardless of time of day,” Dr. Porter says. “In an emergency, you don’t want to make five phone calls to get a patient taken care of,” he adds. “One call to us and we’ll make it happen. And we pledge to not say no to any transfer. The Cooper Transfer Center can be reached 24/7 at 855.CUH.XFER (855.284.9337). The transfer requires physician-to-physician consultation, which the Transfer Center initiates.